Rested, retreated, reinvigorated and all that. The retreat was fabulous - amazing venue, fabulous meals and such a great roomy set up. I even had my own room with french doors going out into the garden. Just lovely. I managed to get 9 layouts done, here's just a glimpse. I don't think I'll get to scan the rest, sorry. I'll post some pics from the weekend later in the week though. I met some really really lovely people. It was just a really nice weekend. Can't wait to do it again next year! Here's a couple of my layouts from the weekend. Doesn't sound like a likely combination does it, but I think it works well. I saw this colour combination yesterday and just had to try it on a card. I have used the following Stampin' Up! colours - Sahara Sand as my base card, and the main layer is Always Artichoke. The image is then stamped on Sahara Sand and I have used Really Rust, Old Olive and Always Artichoke for the image and embellishments. All stamps are Stampin' Up!. The main layer is stamped with the Floral background stamp, and the other stamps used are Terrific Tulips and Warmest Regards (a hostess set). I have also used Hodgepodge and the Stampin Up! moss gingham ribbon. I made the scallops using the Stampin' Up! slit punch. This is my favourite way to do scallops now - it's so easy and I love the depth of the scallop and the even result you get each time. All that for $11.50, what a bargain! 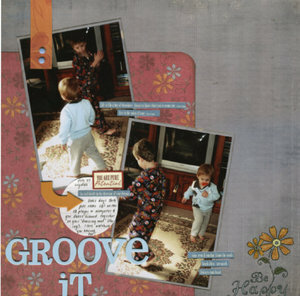 Off on my scrapbooking retreat this afternoon - yeah! I'm hoping to get a few things done, so check in Monday. Hope you have a good weekend too. Still here, just had a super busy week! Didn't get a chance to do much creating, just a couple of cards. Here's one of them. I wanted to try the cracked glass technique with Crystal Effects but it wasn't very successful. It gives a great dimensional glossy effect, but it is too pliable (even after being put in the freezer) to crack very well. Because it is wet for a longer time than embossing enamel, it also causes the ink to feather a little bit. I find using UTEE gives the best result in the shortest time for the cracked glass technique. 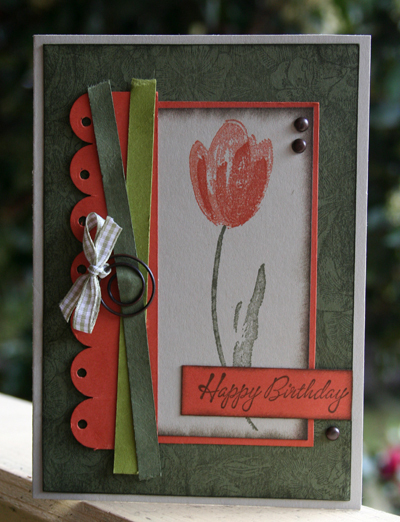 I do really like the Stampin' Up! Crystal Effects though and prefer it to Dimensional Magic because it dries much quicker and is also thicker and runs off the edges less. I have used Stampin' Up! Touch of Nature set. 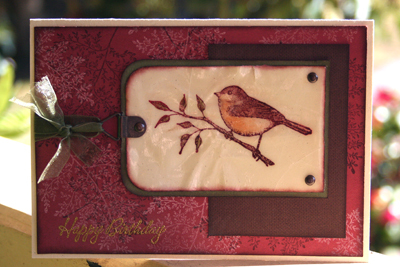 The card is Naturals Ivory cardstock and then I have used Cranberry Crisp cardstock stamped with Chocolate Chip and Very Vanilla as the first layer. The second layer is Chocolate Chip cardstock stamped using the Stampin' Up! Linen background stamp (my new favourite!) in Chocolate Chip ink. The main image is Naturals Ivory matted on Always Artichoke and I have watercoloured the image using the Watercolour Wonder Crayons, before I added the Crystal Effects. I have also used Hodgepodge Hardware and some Stampin Up! olive green organza ribbon. The sentiment is from the hostess set Warmest Regards and I have embossed it using gold embossing powder. Friday night we were glued to the TV for the football. Paul barracks for Collingwood (and I do now to a much lesser degree) and all my family in Perth barrack for West Coast (my Mum was at the game!). It was such an exciting game to watch. Go Pies. Had a great workshop yesterday, a lovely group of a few regular customers and also met some lovely new people. I always find the workshops a really enjoyable way to spend the afternoon and we had fun exploring techniques and introducing the new customers to Stampin Up! They were quick to book their own workshop when they saw the amazing hostess benefits the hostess received. It's great when a group does this as we then get to 'step it up' at subsequent workshops and explore some of the more detailed techniques for papercrafting. Last night it was our kinder trivia night which was great fun. We didn't win (far from it, lol) but we did do well with prizes along the way - vouchers for all sorts of things including hairdressers, Bakers Delight, play centre etc. Most importantly we raised heaps of money for the kinder which was great. Today we just had a quiet family day - took the boys to swimming class and then I just read my book and relaxed which was a much needed lazy day. Hope to get a chance to do some creating this week. I also need to sort my photos and get my pages planned for the Scrappy Hollow scrapbooking retreat I am going to this weekend.I like to use the Cropper Hopper Page Planners, because they have room for papers, photos and embellishments and I always find I get much more done. I am aiming for 10 completed pages (ever the optimist!). I am also planning on completing and emailing this months card template and technique sheet. These will not be posted on my blog, but will be exclusive to my customers and those who subscribe to the email list (top right column). I promise it will be worth it! People often ask me what is the best Scrapbooking store in Melbourne. It's been hard to answer in the past as I have often been on design teams or in some way contracted to various stores, and felt to have written my opinions would have been unfair to the store-owners who had given me that opportunity. Now I am scrapbooking 'just for me' again, I thought I could fairly answer this. Please keep in my mind this is purely my opinion and also that I live in Lilydale, so don't get to visit the stores in the western suburbs of Melbourne. My favourite store would definitely be Scraptacular in Mentone. Why? I like that they carry a great range of up to the minute products, in all the big names I see in the magazines. I also like that they generally get all of a range, so if I want to use the rub-ons or chipboard I know I am most likely to find them there (which is important as it's a one hour drive for me!). I also get blown away by the amazing layouts on display when I go in the shop. They have Kim Ogden (a current For Keeps design team member), Rachel Scholz (a current SM Master) and Kerry O'Toole (a quiet achiever who pumps out so much amazing stuff, but just doesn't like submitting) on their design team. These girls also have started teaching classes there. They also have Robyn Klye on staff as a teacher and working in the shop. 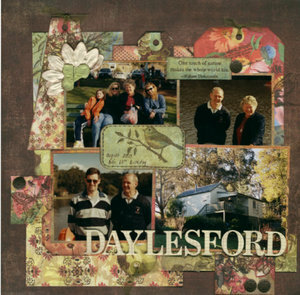 Robyn is one of my favourite scrapbookers (I call her 'Aussie Ali' as she has a similar style to Ali Edwards). I love how she mixes pattern paper and her amazing use of colour. Robyn was one of the winners of the For Keeps A-Z competition last year, and is also currently on the For Keeps design team. I also like the classroom. There's heaps of room (the tables are huge), it's separated from the store and it's colourful and happy. Jodie has recently sold Scraptacular, but the new owner Julie Marshall is just as lovely. 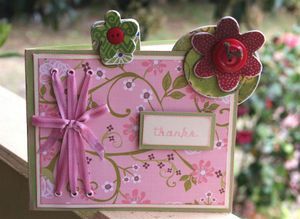 Julie is a long term customer, a great scrapbooker and has some great ideas so Scraptacular will be thriving. You always know you will get a smile and a happy hello from Julie and Anita and Robyn when you visit the store as well. I do monthly crops there (they have the best range of crops in Melbourne in my opinion). Keep in mind if you visit the website, that this is just a tiny amount of what is in store. The turnover in the store is amazing, and new orders come in several times a week. The Scrapbook Scene (Burwood) - a pretty good range, very welcoming and I really like their nice range of in-house chipboard embellishments. Scrappy Hollow (Croydon) - this store is HUGE, has great parking right out the front and carries a pretty good range, particularly of Basic Grey, K and Co, Making Memories and Prima. They also carry lots of die cut accessories. I'd like to see them expand their Bazzill range though and offer more classes and crops. I am off to their retreat in two weeks at the Yarra Grange Country Club in the Yarra Valley, so I am sure I will know lots more about the store after that weekend. Simply Scrapbooking (Eltham) - they carry a good range and have some good classes too. Just a bit far for me to get to these days, but if I am in the area I would always pop in. In terms of on-line stores, my favourite would be Scrapanalia. Trish and Anne Marie are doing a great job with their new venture and they also have really great crops. I am going to their next big Christmas Crop in November - 1.00 to midnight! Woohoo! For Bazzill and amazing custom made chipboard, you also have to check out Remember When. Oh, and best place for stamps? Me of course - email me for a free Stampin' Up! mini catalogue! So there you have it, my faves, my opinions :) Happy Scrapping!